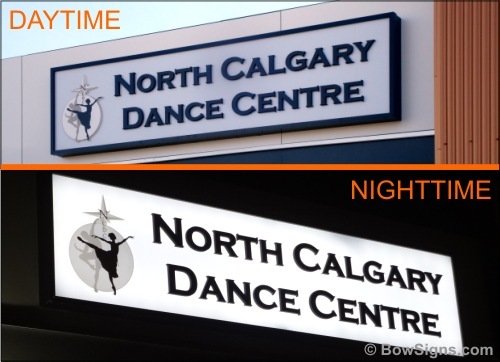 BowSigns is Calgary sign company leading in the manufacturing and installation of illuminated signs for outdoors and indoors. 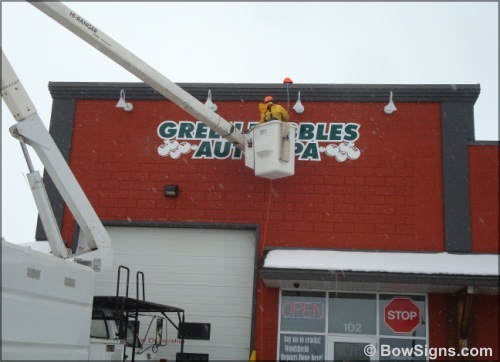 Company also can remove, re-face, and repair existing signs. We do what it takes to fit cost into our Clients' budget. 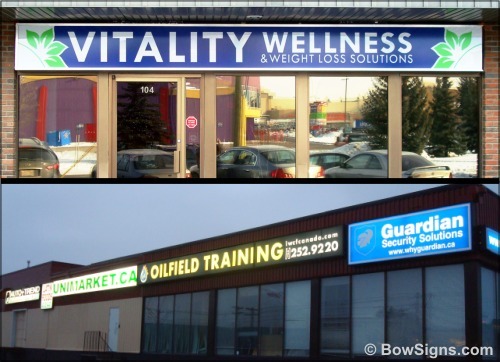 Our company caters to businesses and institutions in Calgary and area (Airdrie, Cochrane, Okotoks, Bragg Creek, Chestermere, Strathmore, High River, Turner Valley, Nanton, Olds, Sundre, Canmore, Banff) for any type of backlit and frontlit signs with installation services included. 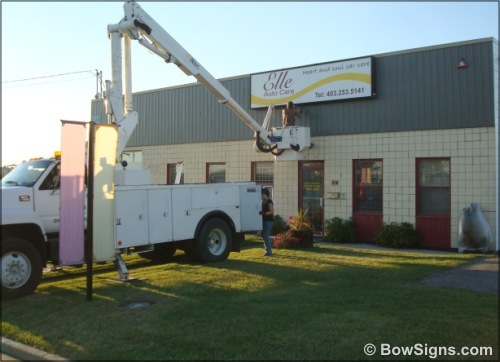 "BowSigns" will assist clients to determine whether or not a development permit is required for their exterior illuminated or non-illuminated building signs (also known as fascia signs). 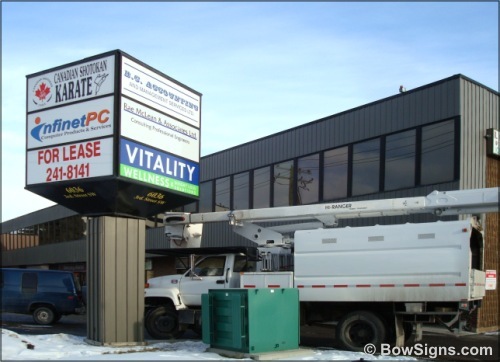 Furthermore, BowSigns offers to apply for a signage permit with the City of Calgary on behalf of its clients (note that there will be a fee collected by the local administration i.e. City of Calgary to process the signage permit application). 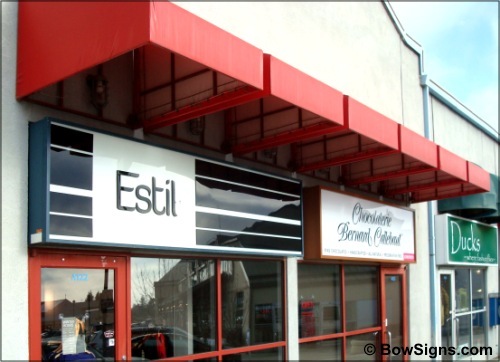 BowSigns shall produce the necessary documents required to be part of the signage permit application package such as elevation drawings of the building with the proposed sign, and a rendering of the sign to scale ("concept elevation drawing") which costs between $250 and $400 depending on the work involved. 1)	Copy of the site plan and elevation drawings of the exiting building in a pdf format (MUST be pdf). 2)	Copy of the Certificate of Title in the province of Alberta. 3)	Affidavit (or a letter signed in front of a Commissioner for Oath) from the Landlord, which indicates our company as their proxy for the purpose of dealing with the local administration to obtain signage approvals. - structural engineering calculations including but not limited to structural loads and wind loads, with signed approval of the architectural design by an Engineer. - obtaining construction permits and calling Alberta One-Call to have the utility provider representatives inspect the site and approve the location for digging for the post(a). 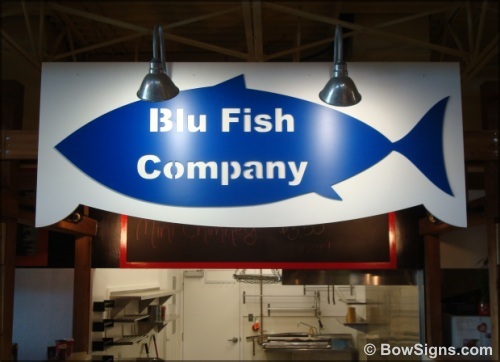 For this type of signage (freestanding), BowSigns will ONLY execute (i.e. do the manufacturing based on the design, and the installation based on approved permits), and not design the structure or set the location. 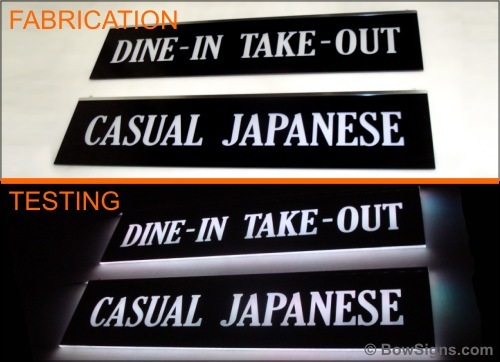 There sample photos below are of signs which are not illuminated from inside, but from independent sources such as halogen lamps, goose-neck lamps, spot lamps. 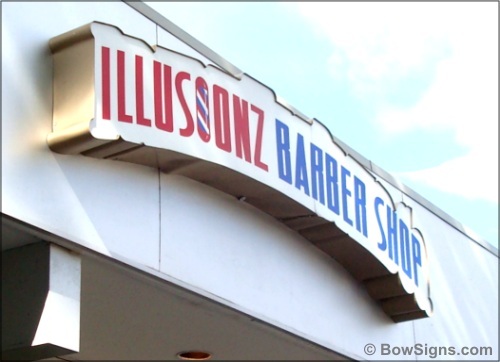 Category includes highway advertising billboards, wall 3D signs. Then, there are self illuminated signs where the lighting is inside and as part of the sign structure. Category incorporates translucent channel letters, halo 3D illuminated letters, and lightboxes. As is stands, "neon" is mainstream wording for illuminated signs. 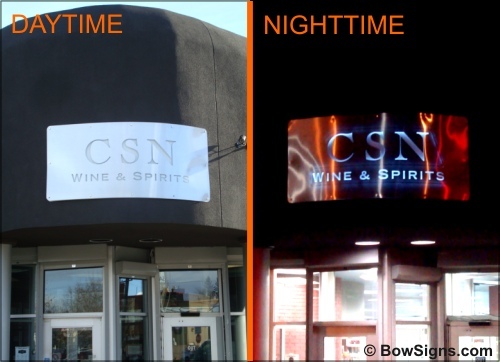 BowSigns recommends using LED lighting due to lower energy consumption, long life, and ability to get a much more uniform illumination (avoiding "hot spots" - bright areas followed by visibly darker areas on a sign). 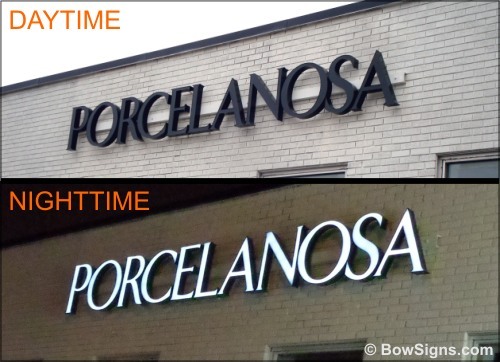 At BowSigns we produce many unique signs for indoor applications that use wall lighting fixtures. 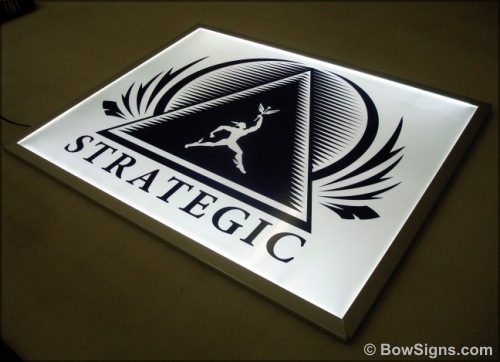 Some of the signs we make can have a glow in the dark appearance due to a LED side-lit feature. 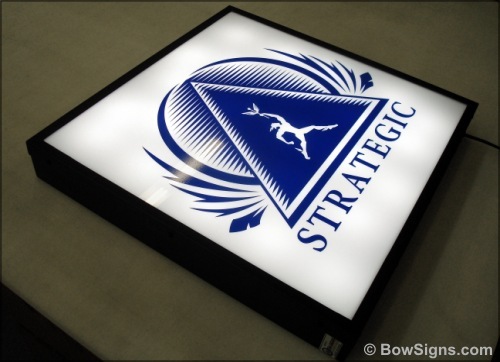 Our illuminated building signs, exterior and interior LED and neon signage products are backed by specific warranties. Such electrical signs are produced in our shop and professionally installed. We incorporate dusk till dawn sensor switch (photocell). 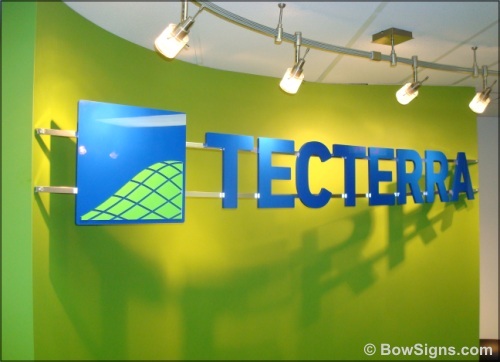 Our company offers light boxes Calgary manufactured using painted sheet metal for the cabinet and polycarbonate (e.g. Lexan) or acrylic (e.g. Plexiglass) for the sign faces; illumination with LED modules or fluorescent tubes. Illuminated signage is considered amongst the best approaches to get a corporate brand or special message recognized and this is the reason they are ordinarily utilized being installed on client's building. 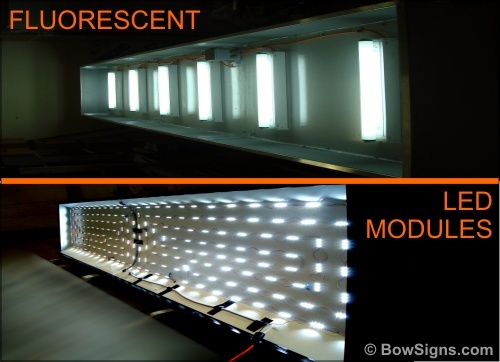 As one can see from the pictures, we test all LED and fluorescent tube illuminated signs in our shop, prior to shipping and installation, for to ensure they work properly and display light consistently. In summary, we offer: manufacturing of new illuminated signs, LED neon sign installations, removal of old graphics and application of new graphics onto pylon and light box sign faces, light bulbs replacing, motor and belt replacing (revolving signs), checking proper sign functioning, repairing of cracks for acrylic (Plexiglass) and polycarbonate (Lexan) plastic faces, repairing of sign frames, painting (touch-ups). Contact us for a free, no-obligations quote. Proud member of the SUPPORT THE LOCAL ECONOMY campaign group. WE ❤ ALBERTA BUSINESSES.